Unlike most other apps on the iPhone, the Google Maps application allows users to manually clear the apps cache. 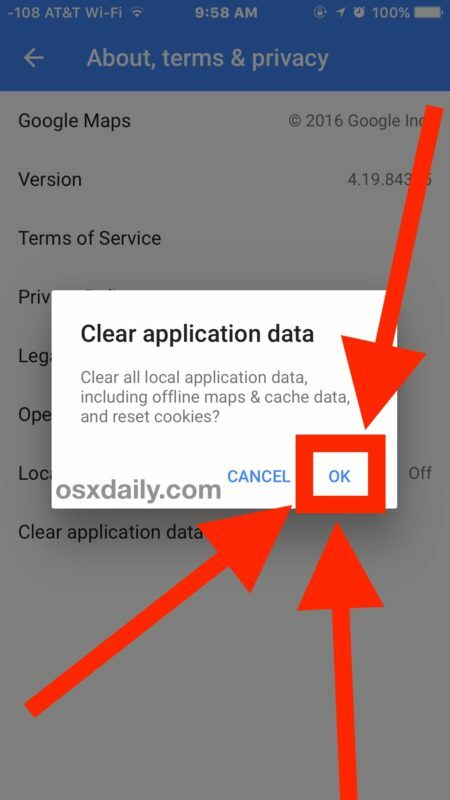 Doing so will remove the Google Maps app specific Documents and Data on iOS, including all local application caches, app data, offline stored maps, and reset any cookies within the Google Maps application. 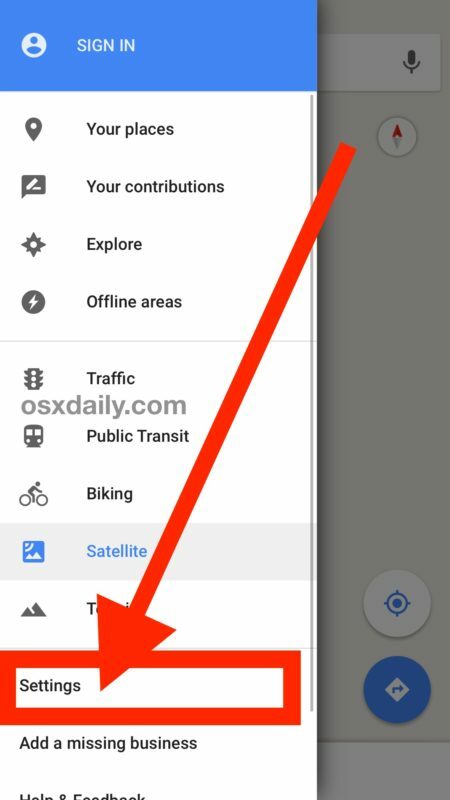 This is a handy feature for Google Maps users, particularly since the Google Maps application can often take up a considerable amount of local storage with map caching and offline maps. 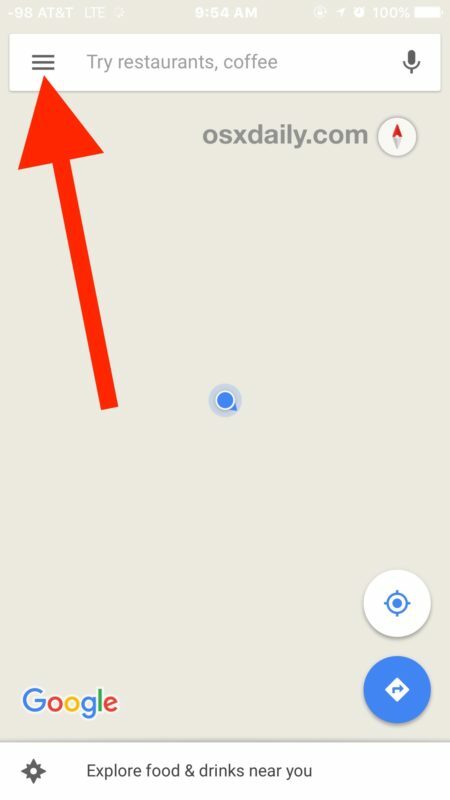 We’re focusing on the iPhone but this ability exists in the Google Maps app for iOS on any device. The application data and caches will be removed, freeing up the space that is taken up by the Google Maps app. This can easily free up several hundred MB of storage, and perhaps even more if you’re a frequent Google Maps user, or if you use the Offline Maps feature in Google Maps. There is no similar feature available in the Apple Maps app that comes installed by default on iPhone. Considering how bloated Documents and Data often are in iOS apps, this is a really nice feature, and one that should be included in more apps, if not iOS settings itself. Instead, for the time being anyway, if you want to delete the Documents and Data on iPhone or iPad for other apps, you need to perform a bit of a circus act and manually go through and delete the application then re-download it again, or if you’re targeting iCloud documents rather than caches, remove them from iCloud directly. Why doesn’t every app have this? iOS needs a dump cache settings option. My Other space on my iPhone is over 6GB, it’s all app cache and who knows what that I can not empty. But would Apple sell more iPhones if they made more efficient use of space on current iPhone models? I suspect Apple likes the storage crunch for business reasons, but it sure creates a lot of frustration for every iPhone user I know. I wish all apps had this ability. I don’t have an option on google maps settings to “clear application data”. 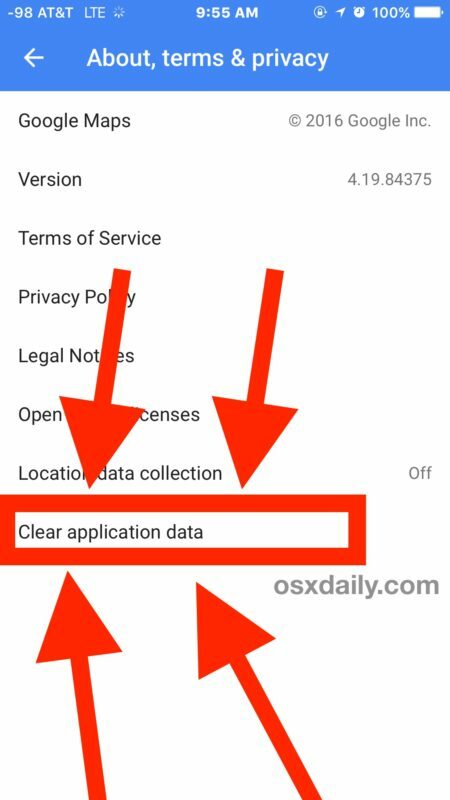 I don’t have the option to ‘Clear application data’…. I’m in Australia, perhaps this is specific to American iPhones? I’m also annoyed at how many ‘compulsory apps. we’re automatically loaded onto my iPhone 6s when I bought it…. Therefore not giving me the 64gb which I bought. How is that fair? I don’t have one either, and the settings menu is totally different than the one depicted in this tip. Where did you find it? 1)Settings; 2)About terms and privacy; 3)Clear application data. Charlie, my settings are not what the article had so I did as you said, but when I hit “clear application date,” nothing happens. I’m having to remove them site by site, and there are hundreds. Very frustrating! Many thanks to Charlie – appreciated. I cleared the info and went from 9.1 MB of Google Maps in storage to 15MB, exactly BACKWARDS. How/why would that happen? My head just ‘sploded! I’m also annoyed at how many ‘compulsory apps.’ were automatically loaded onto my iPhone 6s by Apple when I bought it…. Therefore not giving me the 64gb which I bought. How is that fair? Some apps allow you to delete cache but many do not, and many do not completely delete app cache in the process. Apps like WhatsApp, Instagram, Facebook, and other Facebook apps seem to generate more cache and hold onto it in a particularly persistent manner for whatever reason.